The form here includes the basic rental application containing data on the potential tenant. These include name and other identification details along with rental/residence history, desired date and length of occupancy. If you are about to take a home on rent, you have to fill up and submit a rental home application form to your prospective landlord. The form would ask for your employment history. 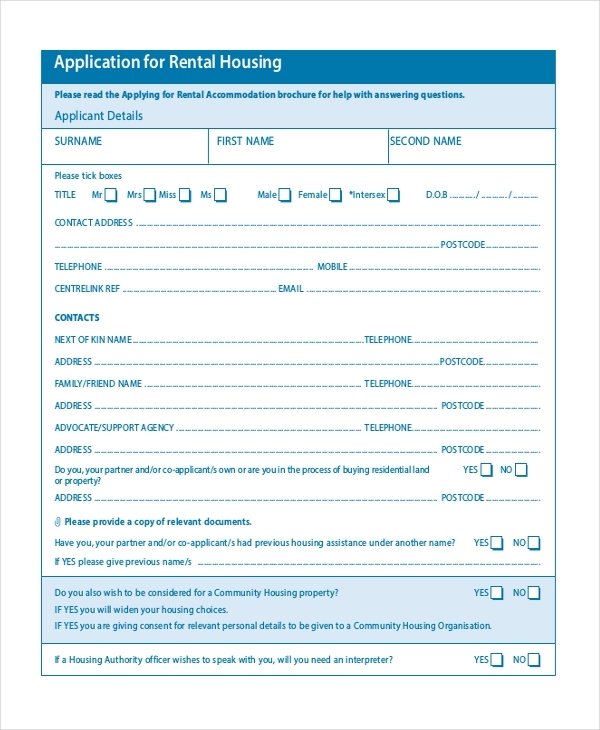 This form needs to be filled up while you are about to rent a residential property. At times commercial properties are also taken on lease by issuing this form. Such forms further help the landlords to compare and choose the best tenant. 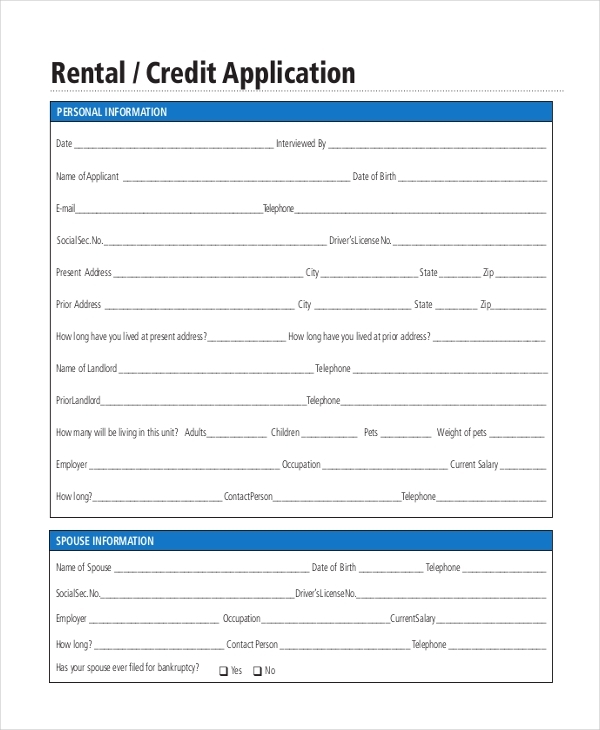 A rental credit application form houses a good deal of information on the tenant, including his name, present address, prior landlord, spouse data and of course his bank information, such as account numbers. If you want to rent an entire house – be it of one or 2 storey kind, then you need to fill up this form. You can modify the document as per your need by using MS Word. Properties when given on rent for commercial or personal use demand the potential tenants to apply for the lease through a rental property application form. It helps the landlord to check the employment and residential details of the applicants. 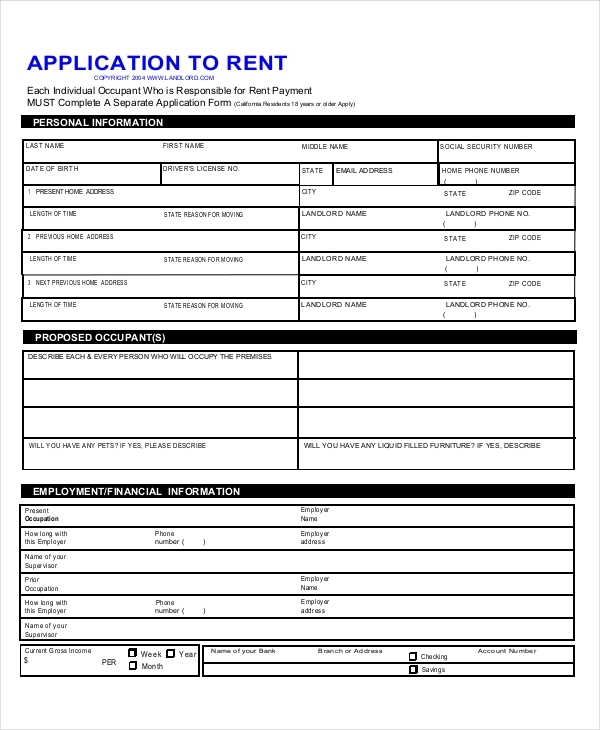 A rental lease application form features detailed information about the rental property along with applicant’s data. 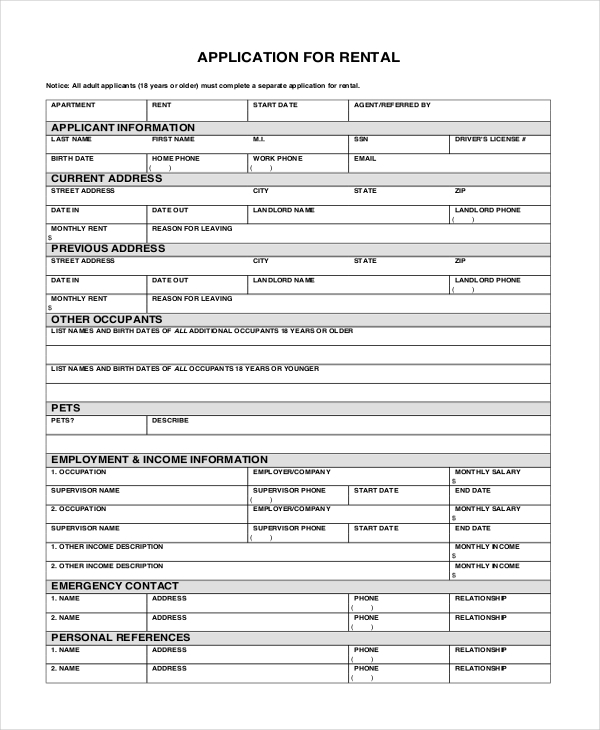 Besides, the applicant’s employment history is also needed for the form. In case, there is a co-applicant, he/she must be mentioned in the form as well. 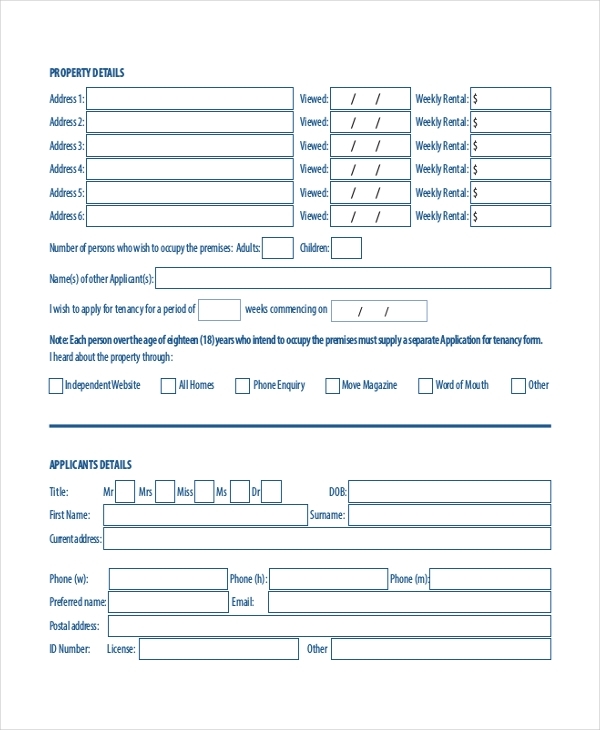 This is a basic sort of a rental application form that is meant to be used by people looking for houses and apartments for residential purposes. Such forms help the potential tenants to detail information about them based on which the landlord finalizes the rental settlement. How Does a Rental Application Form Help? What Constitute a Rental Application Form? A rental application form is usually a pretty detailed document housing elaborate information about the potential tenant. It usually starts with the personal information on the applicant, including name, SSN, driving license number and contact details. Some of the forms also ask the applicant to state the number of people to be occupying the rented premise with him or her. Moreover, such a form usually dedicates an entire section on employment/financial history of the applicant- that would include details of the applicant’s employer, occupation and bank account numbers. Last but not the least, the form will also ask the applicant to note about current and prior residential history. Do They Charge for The Rental Application Form? 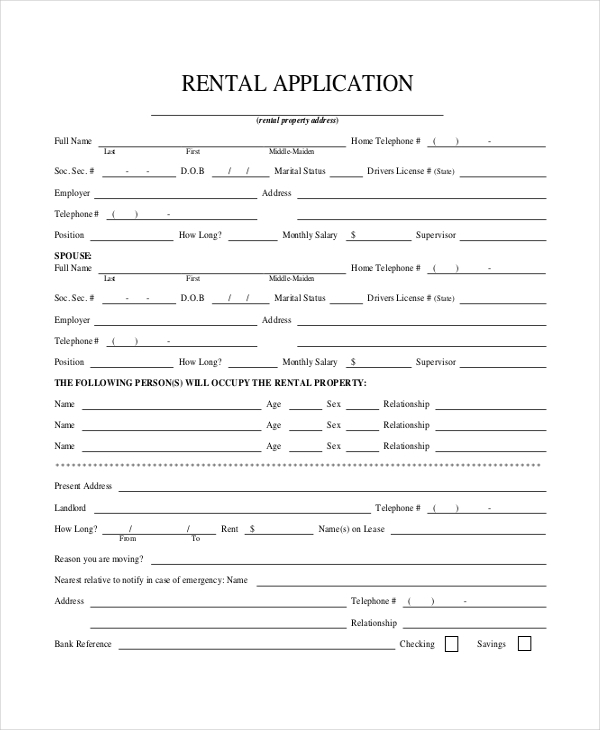 A rental application form makes a rental application formal on part of the potential tenant. On the other hand, the data collected from the form assists the landlord in taking a convenient background check on the tenant. There are pre-designed rental application form templates today which can be easily customized.